On Tuesday September 6 the Justitieel Complex Zaanstad (JCZ) has been officially opened by king Willem-Alexander. De Sluis was also present at this official moment! 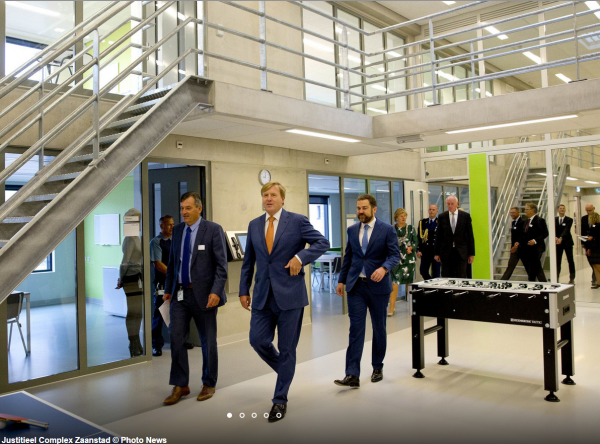 At the picture you see the king Willem-Alexander walking through one of the parts of the prison complex that is still empty. Above and below you see the corridors with cells (withouth bars). The area in the middle is for entertainment. The departments for labour and sports are easily accesible from the cell departments. Eventually the plan is that prisoners can move through the prison complex on their own, with their own key card (though closely watched). In the middle of the complex, between the four cell deparments, lies the area for church celebrations, group sessions and trainings. This is the place where the volunteers of De Sluis will be most active. The parend-child activities will most likely be held in on area that is closed to the entrance so that the children will not have to go so deep into the prison complex. Soon the first inmates of the “Huis van Bewaring” (jail) will be brought to the Justitiaal Complex Zaanstad. Until then, the only department in use is the Psychiatrisch Penitentiair Centrum for inmates (clients) with psychiatric indications. The volunteers of De Sluis are already active for these inmates through their assistance at church celebrations. DSG de Sluis has officially been labelled an ANBI, a foundation that is serving the common good, from its foundation date December 23, 2015. This means that all gifts to De Sluis from that date on can be deducted from your income taxes! On June 14, 2016, the covenant was closed between De Sluis and the department “Geestelijke Verzorging of the Ministry of Justice. As a resolt of this covenant the diaconal pastor of De Sluis can now work independently in the Justitieel Complex Zaanstad under responsibility of the department of Geestelijke Verzorging. The diaconaal pastor thus has become part of the team of Catholic and Protestant prison pastors in the Justitieel Complex Zaanstad. 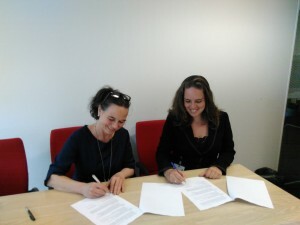 At the picture you see Thea Bogers (left), director of the Department Geestelijke Verzorging of the Ministry of Justice, and Elianne Schultz (right), director of De Sluis. 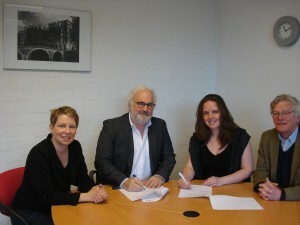 De Sluis and Exodus Nederland have closed a covenant at April 29, 2016, in which both organizations have agreed to cooperate when it comes to emplying volunteers in in prisons. Now that the famous Koepel prison in Haarlem and the Amsterdam Bijlmerbajes have closed, that new prison Justitieel Complex Zaanstad will hold up to 1.100 inmates from the area Amsterdam, Haarlem and Zaanstad. The supermodern prison complex is located in Westzaan. On June 1 the first inmates will enter the JCZ and at this date De Sluis will also start employing volunteers in the JCZ, in cooperatin with the prison pastors. Exodus Nederland has approximately 1.800 volunteers working with (ex-)prisoners and has a lot of expertise in the training and coaching of volunteers what work in this specific field. At the picture you see (from right to left) Irinda de Groen (coordinator of volunteers at Exodus), Jan van Gils (interim director Exodus Nederland), Elianne Schultz (director of De Sluis) and Pim van Doorn, vice president of De Sluis).